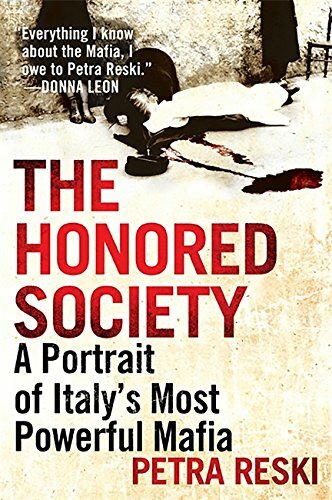 Petra Reski’s The Honored Society purports to be, and is being marketed as, an exposé of the ’Ndrangheta, the criminal organization based in the southern Italian region of Calabria that has expanded its operations throughout Europe. But it’s really a Mafia romance. A German journalist who has covered the organized crime beat for newspapers and in books, Ms. Reski details the economic and political power, and the horrific violence, of the ’Ndrangheta, and of Sicily’s La Cosa Nostra and Naples’ camorra gangs. But her up close and personal accounts of some of Italy’s most notorious gangsters often betray not only a morbid fascination with these violent men and their crimes but also admiration for, and even infatuation with them. They—mafiosi, camorristi, ’ndranghetisti—do terrible things, but they’re bold, clever and enterprising, as well as rich and powerful. There’s more than a whiff of fatalism in Ms. Reski’s Mafia romance. Prosecutors may prosecute, but Italy’s Big Three crime syndicates are too vast and entrenched, too connected to the worlds of politics and big business, for law enforcement to be much more than a minor annoyance. Ms. Reski thus feeds these criminals’ self-flattering mythology of themselves as omnipotent and indestructible. In Godfather II, Hyman Roth told Michael Corleone that the Mafia was “bigger than U.S. Steel.” Ms. Reski tells us that the real, as opposed to reel mafias are bigger than any single industry. They are transnational combines with operations not only in Italy and Europe but worldwide. Their business interests are both illegal and legitimate. The legit enterprises, besides being cash cows, launder the profits from criminal activities. None of this is news, of course, and that’s perhaps the most surprising thing about The Honored Society: how second-hand it all is. There’s little here that John Dickie didn’t report, with greater analytic rigor and insight, in his superb Cosa Nostra, the best English-language account of Italian organized crime, or Alexander Stille in Excellent Cadavers or Roberto Saviano in Gomorrah. The inspiration for The Honored Society was the 2007 murders of six ’ndranghetisti in Duisburg, Germany, by a vengeance seeking rival faction. The killings shocked Germans and alerted them to the unsettling presence of the ’Ndrangheta in their country. Reski set out to investigate, speaking with German and Italian law enforcement officials and visiting San Luca, the ’Ndrangheta-dominated Calabrian town that produced both the Duisburg assassins and their victims. When The Honored Society was published in Germany a year after the Duisburg killings, Ms. Reski was threatened; soon afterwards, she faced lawsuits from two Italian businessmen she had named as organized crime associates. A court ruled in favor of the litigants and several passages of The Honored Society referring to these men were redacted. Ms. Reski’s German publisher has filed an appeal against the ruling with Germany’s highest court. The redacted material, however, amounts to barely three pages of the book. Most of The Honored Society isn’t about ’Ndrangheta at all. Ms. Reski didn’t have enough material for a full-length exposé of the organization so she instead has padded the book with recycled Mafia history and recollections of her earlier adventures in Mafialand, mostly Palermo, in the company of Letizia Battaglia, a renowned photojournalist and anti-Mafia activist, and Battaglia’s daughter. Uninformed readers may get the impression from Reski that these two women, along with a prosecutor or two and the odd civilian, are just about the only Sicilians opposed to the Mafia. Everyone else is either in it, complicit with it, or victimized by it. Battaglia is admirable, even heroic, but she’s now nearly 80, bitter (understandably so) and basically irrelevant, since she’s no longer a significant figure in Sicily’s anti-Mafia movement. But she makes a great character in Ms. Reski’s Mafia romance: a long-suffering, chain-smoking mater dolorosa snapping photos and making sardonic observations about the Mafia and Sicily. Even caponata—a luscious dish that’s one of the glories of Sicilian cuisine—becomes sinister, something only Sicilians can stomach. Even worse, Ms .Reski writes as if the Mafia wasn’t the product of history and political economy—it’s inherent in Sicilians, part of their cultural DNA. The Honored Society promises to expose and sound an alarm about a truly dangerous phenomenon, the ’Ndrangheta. This disjointed, repetitious, and anecdotal account fails to deliver on its promise. But it should give a vicarious thrill to Mafia-lit fans, confirming skewed, prejudicial notions about southern Italians. George de Stefano is an author, critic, and blogger whose work has appeared in many print and online publications, including The Nation, PopMatters, Rootsworld, Cineaste, Film Comment, the Gay and Lesbian Review Worldwide, the Advocate, I-Italy, and others. He is the author of An Offer We Can’t Refuse: The Mafia in the Mind of America (Faber and Faber/Farrar, Straus, Giroux) and a contributor to The Essential Sopranos Reader (University of Kentucky Presses, 2011) and Mafia Movies (University of Toronto, 2011). He is a member of the Author's Guild and the National Book Critics Circle.